Over the last 70 years, the NHS has transformed the health and wellbeing of the nation and become the envy of the world, but to remain effective the NHS needs to change. 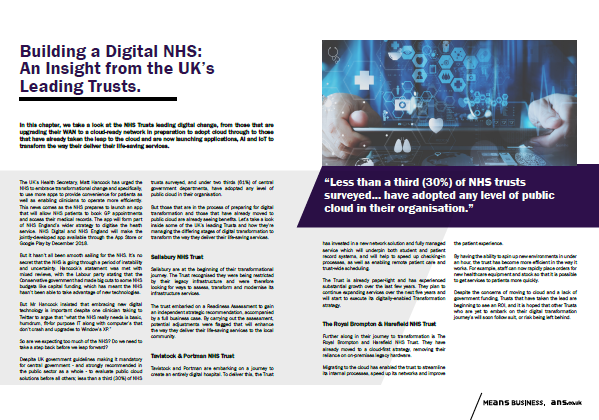 In this ebook, we’ll take a look at how NHS Trusts can begin their transformational journeys – from assessing existing infrastructure to understanding how best to migrate patient data to the cloud. Once we’ve discussed building the foundations for transformation, we’ll then go on to discuss, how you can build a suite of advanced services, harnessing technologies such as AI, big data, application development and IoT. Along the way, we’ll include real transformational journeys from NHS Trusts that have already embarked on the road to end-to-end digital transformation with the support of ANS.